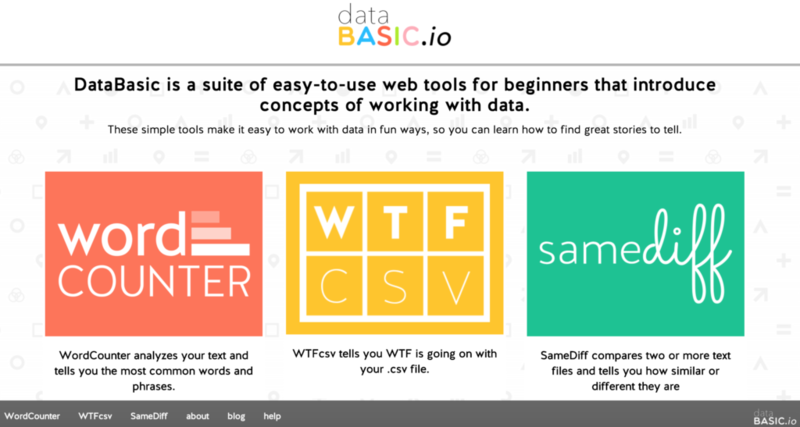 DataBasic is a suite of easy-to-use web tools for beginners that introduces concepts of storytelling and working with data. It is a project of the Engagement Lab at Emerson College and the MIT Center for Civic Media. DataBasic comprises three tools to help you understand textual and tabular (tables) data: WordCounter, samediff and WTFcsv. The tools were tested in classrooms and workshops to make sure they worked well and were easily understandable. Users can visualize the resulted information in a variety of useful formats that facilitate better understanding of the concepts (e.g., color-differentiated tables with graphic cues that can increase retention). Data Basic Word Counter: Word Counter tells you the most used words and phrases in a document. It helps you quantitatively summarize your text so you can investigate how words are used. It creates a basic word cloud, but also does word counts, in several new interesting ways by breaking its analysis into a few different pieces — A word cloud, Top Words, Bigrams, and Trigrams. WTF CSV: WTF CSV gives you a quick overview of a CSV file you upload. It’s designed for the data newbie who has no idea what to do with a spreadsheet. It helps a user peek behind all those columns and rows through some simple analysis by giving you the frequencies of each attribute (column) in a table, presenting it as a histogram or bar chart or word cloud depending which visualisation is most appropriate. It also provides a “What do I do next?” set of questions that can help prod the beginner. Same Diff: SameDiff lets you compare two documents to see how they are similar and different. It helps you see differences and similarities in the words used in each file so you can learn about quantitative analysis of text. SameDiff compares one corpus (a collection of written text) of text to another corpus of text to show you similarities and differences. It uses a cosine similarity algorithm (based on the number of times words are used in each) to rate whether the documents are really similar or totally different. Type of learning: Students learn to analyze and share data that can help them understand the world. Privacy: The Data Basic website stores information uploaded for only the amount of time it takes users to analyze the data, then it is deleted. The aggregate results shown (metadata) are kept for 60 days, and then get deleted. Ease of Use: Tool has simple and easy-to-use interface. Accessibility: Data Basic supports screen readers. Options to choose closed captions in three languages (English, Spanish and Portuguese) for all the tutorials on the website. Power and Bias: Website is available for English, Spanish and Portuguese speakers . ISTE Standards for Students: Hands-on approaches to analyzing data. Students construct their knowledge through collecting data and trying to find stories and information within it. Ability to quickly communicate a data-driven story to others. Awareness of what kind of questions you can and should ask text data. Substitution: Students upload a dataset to WTFcsv to get a series of visual charts rather than designing their own charts on paper in class. Augmentation: Word Counter instantly generates word clouds and bi-/trigrams of most popular words in a text, which provides students with a new way to analyze textual data. Modification: Using Samediff, students can instantly compare and contrast two different text documents. Redefinition: Students can make hypotheses about textual data and get immediate results to confirm or reject their hypotheses. Far too often, technology is used as a direct substitute for other low-tech tools (e.g., pencil and paper). While substitution has some benefits (e.g., students develop their technology skills and knowledge), we encourage you to think about how you might use Twitter to modify or redefine learning. Math/Visual StoryTelling/Sketching: Use WordCounter to analyze a musician’s lyrics and sketch a story with their words. Sketching a data story helps participants build their data literacy by finding and drawing a story about what words show up in famous musicians’ lyrics. Infographic for this lesson activity: Use WTFcsv to identify some questions to ask your spreadsheet. This hands-on activity helps participants build their data literacy while looking at some fun datasets and brainstorming questions you can ask about them. Infographic for this lesson activity: Write Your Own Song Use SameDiff to analyze the lyrical styles of two musicians and invent a duet for them. Personal Narratives: Write, or copy and paste, a personal narrative into Wordle. Students will be able to see what is important to their peers from the visuals that are produced from the Data Basic WordCounter’s word clouds, Top Words, Bigrams, and Trigrams. These word clouds make great displays for a classroom bulletin board. Current Affairs Analysis: Copy and paste a news story into Data Basic WordCounter. Ask students to guess what the story was about and generate a headline based on the results. Student Profiles: Have all students in your class write a few positive adjectives about each of their classmates anonymously. Compile all the papers, input the adjectives for each student into WordCounter, and generate a student profile word cloud to give back to the student. Collaborative Group Work: For the solar system, student teams could each be responsible for creating Word Clouds to describe one of the eight planets or in a Math class student teams could be responsible for creating a visual representation listing all the types of quadrilaterals. Compare and Contrast: Compare and contrast the documents of two or more students’ writing, famous speeches, song lyrics, news reports, or book reviews. Word Counter: You can use any sample from drop down menu, paste a url, paste a text or upload your own file. Hit Count button to get started . WTFcsv : You can use an existing sample file from the drop down menu or upload your own file. Hit Analyze button to continue exploring. SameDiff : You can use an existing sample file from the drop down menu or upload your own files/speeches. Hit Compare button to continue exploring. You can go back and forth between each of data basic tool by clicking on the menu at the bottom.